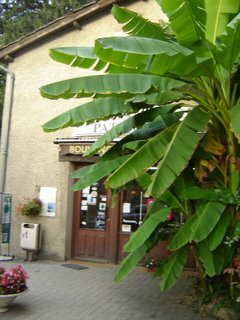 This morning I woke up early and walked to town to get some fresh bread at the local bakery. 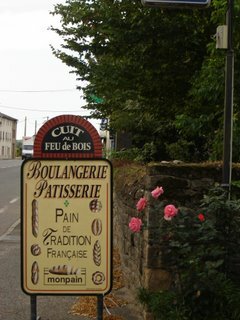 Bread is something that the French take very seriously and must be gotten fresh everyday. The bread is amazing and for 3.75 Euros... you get lots of great bread! Fresh bread is definitely something I like about France! 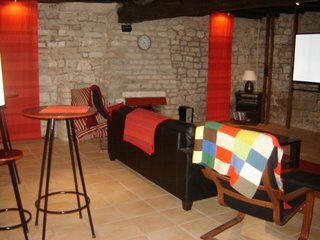 In the basement of the Chateau is a newly remodeled room for multimedia fun. I'm currently watching one of the two dvd's they have in their library. The movie is projected onto the white screen on the far right of this picture. There is also fooseball table and a coffee bar with espresso. 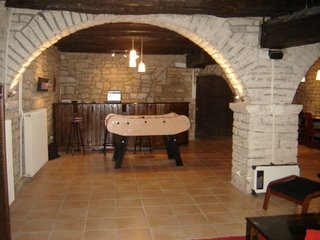 The Cave (prounced like Cuv in French) is equipped with two Apple computers and wireless (which has been run throughout the Chateau). It's a comfortable retreat. This morning started out with a bang. Amy (one of the girls I'm staying with) went to catch a glass as it was falling from the table, but too late because it was already broken. The glass shattered to the floor and cut her hand on the way down. As she was bleed quite profusely, Kristen (the other roommate) and I attended to the mess. If you know me, I don't do well with blood (which might be a slight understatement). I tried not to pay attention to her bleeding episode and concentrate on vacuuming of the glass. I managed to get through the whole ordeal without getting nauseous... major accomplishment! We did some more shopping today for the Chateau. Lots of food to buy for 150 people. Then we came back and spent some time drinking tea, eating ice cream, and chatting about everything from French culture to ice cream. Another thing I like about French culture (bread being the other) is the lingering discussions over food! Tomorrow I'll be driving to the post office and then to an open market in the town of Macon. Could be an adventure!